As a writer, you might have heard the theory that minor characters should be reflections of your protagonist. But does that mean minor characters can’t have their own heroic moments? Absolutely not. There’s room for more than one hero in your book. In fact, your protagonist might need a few heroes in the background, ready to help him get out of a scrape. At first read, Aunt Polly comes across as a bit of a nag. She preaches. She scolds. She dishes out castor oil and keeps a tight lid on the jam jar. Polly definitely breaks the mold for adopted parents. (Move over Miss Havisham!) And she does what Twain characters do best; she reminds us that even quaint characters can harbor tenderness and conflict in their hearts. How is Polly a hero? In the Potterverse, everyone has a backstory and a backstory for their backstory. Yet, we don’t know much about Regulus Black, one of only five people with the brains and the guts to hunt down Voldemort’s horcruxes. Above: Would you have the guts to boat across this inferi-infested cave? We know that he’s Sirius’s brother, that he was sorted into Slytherin, that he was once a Deatheater, and that he really loved his house elf, Kreacher. A perfect encapsulation of bravery and humility that makes us wish we could have gotten to know this character a little better! How is Regulus a hero? She calls Holden out on his angst. “You don’t like anything that’s happening.” [Phoebe said]. It made me even more depressed when she said that. took out my red hunting hat and put it on my head. “Don’t you want it?” I said. After which, Holden is “damn happy” for the first time in known history. How is Phoebe a hero? After ten years of washing up on foreign shores only to discover that the locals are monsters, Odysseus is understandably excited when his long-lost-bestie, Eumaeus, welcomes him back to Ithaca. Homer’s excitement about Eumaeus, on the other hand, is a bit mysterious. In his descriptions of Eumaeus, Homer bursts out of third person for the first (and only) time in the story. “And you, o my swineherd…” Homer cries, as if he himself is greeting Eumaeus. Above: And you, o my swineherd? We may never know what’s up with Homer and swineherds, but we do get to learn a bit more about Eumaeus. Turns out, he’s a Syrian prince who was captured by pirates and sold as a slave to Odysseus’s family. That’s a spin-off waiting to happen! How is Eumaeus a hero? Sister Simplice is by far the most obscure character on this list, but without her, Les Miserables would come to a screeching halt around page 500. She was a person– we dare not say a woman–who was gentle, austere, well-bred, cold, and who had never lied. She was so gentle that she appeared fragile; but she was more solid than granite. She touched the unhappy with fingers that were charmingly pure and fine. Let us emphasize one detail. Never to have lied, never to have said, for any interest whatever, even in indifference, any single thing which was not the truth, the sacred truth, was Sister Simplice’s distinctive trait; it was the accent of her virtue. However pure and sincere we may be, we all bear upon our candor the crack of the little, innocent lie. She did not. Jean val Jean is hiding under his bed in chamber. Javert comes to find him and put him in jail. The only person who stands–or rather kneels, praying–between them is Sister Simplice. How is Sister Simplice a hero? Izz is one of the milkmaids hopelessly in love with Mega-jerk Angel Clare. Her feelings are shown in a number of sweet, humble gestures. She kisses his shadow when it falls on a wall near her. Her lips “go dry with emotion” when he carries her across a creek. There was no enmity or malice between them. They were generous young souls; they had been reared in the lonely country nooks where fatalism is a strong sentiment, and they did not blame [Tess]. Such supplanting was to be. 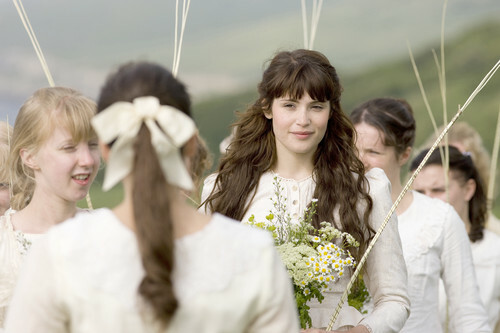 Above: The girls even serve as bridesmaids in Tess’s wedding. All the girls are kind to Tess during her wedding preparations, but Izz stands out as the strongest character after the dreaded day. Mariana takes to drinking. Retty tries to drown herself. And Izz, despite her own heartache, picks the other girls up and tries to help them move on. Later, after Angel dumps Tess, Izz gets an even more dramatic opportunity to shine. Angel stumbles upon Izz one day and asks her to run away with him to Brazil. Izz agrees, but during their flight on horseback, Angel asks her if she loves him more than Tess did. Nobody could love ‘ee more than Tess did. She would have laid down her life for ‘ee. I could do no more. Her statement finally prompts some stirring of Angel’s conscience, so he puts her off the horse and leaves. Jerk. How is Izz a hero? The Fox is just one of several cameo characters in The Little Prince, yet his quotes fill up most of The Little Prince coffee mugs, t-shirts, and posters you see online. Above: If you’re wondering what kind of fox lives in the Sahara, here you go! It’s not just because he’s cute and cuddly. The Fox’s got mad teaching skills. His lesson begins when the Little Prince asks what “tame” means. How is the Fox a hero? Who’s your favorite minor character? I will always remember Frederick in all the Light We Cannot See by Anthony Doerr, that young boy taught Werner ((one of the central figures of the book) about the importance of doing what is right not what is popular or safe in life no matter how difficult the situation and not to second guess our principles. thank you for this brilliant post, minor character do get missed. i liked your thoughts on the fox in Little Prince, he was my favourite one too. One of my favorite minor characters is Mrs. Proudie, the wife of the wimpy Bishop Proudie, in Anthony Trollope’s novel “Barchester Towers.” She’s a nightmare of woman, one whom you love to hate. Dr. Watson, in the Sherlock Holmes series is a great favorite. I like him as much as I like ol Sherlock. Now that I think about it–maybe Sherlock’s the minor character! Ha! Inspecter Chen is a modern day police detective in China who constantly decries China’s sluggish and paranoid bureaucracy, works with a partner to solve crimes in China. Chen is a likable character even though he comes off as being a bit pompous at times. His partner, Detective Yu is absolutely wonderful. He and his wife Peiqin are devoted parents to a single son who is struggling to get a university education and they equally dedicated to Detective Chen’s success. I think around the second or third novel, I realized I looked forward to scenes that include these two. I definitely cared about them more than I did Inspector Chen. This is a cool idea! Thanks Miles! Who should paint Jane Eyre’s portrait? Why are there so many orphans in literature?